Hope is wonderful. It can be simple; a feeling of good expectations, a comfort during trying times. Or, it can be far more incredible; strength, determination, a driving force capable of changing the very course of history. This is Millennium – A New Hope, a traditional RPG that pits the few against the many, the weak against the strong, the determined against the entitled. With charm, depth, and innovation, Millennium is an experience abounding with potential. Millennium introduces a story rife with oppression, injustice, and resolve, as one strong-willed woman is driven by hope and unwavering in her quest to upheave society’s practices of exploitation and ignorance of its downtrodden people. Taking place in the land of Myst, the capital city of Mystrock rules with a greedy mentality, only concerning itself with its own citizens and uncaring of what happens to all outside its city walls. The population outside the city suffers from poverty, starvation, and disease, as their arable lands slowly rot away into pernicious swamps. Our heroine, Marine, comes from one of these many villages forgotten by its kingdom, witnessing firsthand the atrocities by this dereliction. 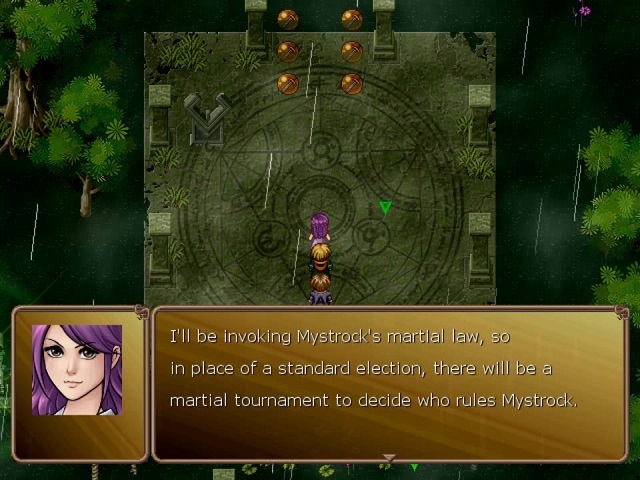 However, as a new election for Mystrock’s rule approaches, Marine learns of a stipulation, the Martial Law, which would allow her to challenge and potentially supersede the current, uncontested ruler. Marine must gather 13 warriors to initiate the Martial Law and challenge Mystrock’s strongest if she has any chance of usurping power and bringing lifesaving change to her people. Millennium serves a launching point for a story that spans over a pentalogy of games. Plot wise, we are introduced to our main protagonist, as well as her budding fellowship as she begins her journey to find 13 champions willing to stand with her against tyranny personified. Unfortunately, that’s all we really get in this first game. We are given the overarching quest, the reasons for, and that’s it. There is no further plot development, which is rather upsetting, especially given the magnitude of the events to come. It’s disheartening because it reads as if this game’s sole purpose is to segue into the next one, never giving this individual game’s plot the strength to stand on its own. But what Millennium lacks in story depth, it makes up for in character development, and this it does very well. I absolutely love Marine, from her conviction and fearlessness in achieving her goals, to her boundless energy and her jovial nature in her enjoyment of simple pleasures. More human traits, like her staunch, almost stubborn responses to her detractors and her hope, such impassioned hope that cuts through any negativity, naiveté, or unease from an unknown fate are impressively developed. This is a character I can get behind, one whose emotions I can feel and whose fate I wish to witness to the end. Sadly though, other characters don’t receive the same level of development or depth Marine benefits from. Benoit, Marine’s cousin, is the pragmatist of the group and although I believe his personality was to serve as the antithesis of Marine’s, he’s instead just a whining pessimist with dialogue that’s more often annoying rather than the intended implicit push or boost for Marine. Then there’s Karine and Hirado, who fit common molds rather than expressing any unique personality. I like Hirado’s soft-spoken, poetic style of speaking and Karine’s upbeat, determined, supportive persona, but I wish they had received the same degree of personal and emotional depth. Perhaps we’ll get to see more of their personalities and development in later installments, but here they’re just a little too flat compared to the brilliant levels of personality Marine receives. Despite the lesser depth of the supporting cast, fortunately, they all play off of each other strongly. I consistently found myself looking forward to cutscenes and other opportunities for these characters to interact. I especially like Jeanne’s indirect role as Marine’s subconscious, saying what Marine is thinking with a bit of an edge to it. Hearing their inner and outward opinions about one another and their journeys are a pleasure and enhance immersion remarkably. And with a first playthrough taking more than 20 hours, I’m happy to say that much of it is filled with these amusing, pleasant, and entertaining moments. It’s all the more reason why I wish the supporting heroes were given that depth Marine received, as I’m sure the results would have been even more immersive and striking. 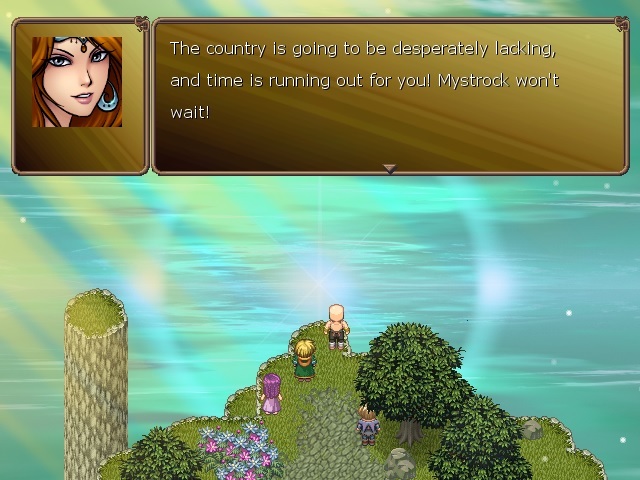 Moving on to gameplay, Millennium’s gameplay is not overly outstanding, as common RPG Maker fare pair with an attempt at implementing old school point-and-click mechanics. Half of the gameplay is combat based, utilizing the prebuilt turn-based mechanics the engine provides. From normal attacks, to special skills that inflict extra damage or additional states (sleep, paralysis, etc…), combat is nothing new, yet it functions without issue. There is a hint of an elemental system, in which five colors represent different affinities, but that goes as far as learning not to use a spell or skill with the same color as the enemy you’re currently fighting. Maybe it goes deeper, with a strength/ weakness pentagon, but it’s never explained in-game. There’s also an attempt to link skill leveling with usage, but that particular mechanic is only used for Benoit’s hand skills and I actually couldn’t detect any changes from repeated use. Power will increase with normal leveling up anyway, so it’s not worth worrying about. What I like the most are the options to adjust enemy encounter rates and visibility. Choosing to make enemies visible is quite helpful, especially if you’re revisiting areas and want to avoid battles. While first trips through areas will often have ambushes and other hidden or forced battles, revisits can proceed faster by simply avoiding visible enemies. Or, if you prefer the old school style of random encounters, you can choose to hide the enemies and incrementally adjust encounter rates, which are dependent on steps taken, to your preference. For example, if you’re scavenging for specific enemy drops, you can increase the encounter rates by decreasing steps taken between battles. If you feel you’re fighting too often, you can change the rate by as many as 50 steps taken between battles. You can even increase the speed of the battles themselves to quicken the overall pace. In its entirety, the traditional turn-based combat system serves its purpose, as it provides familiar, simple gameplay and it’s not broken. But, I’m sorry to say it’s just a basic, repetitive endeavor, lacking in any real innovation. 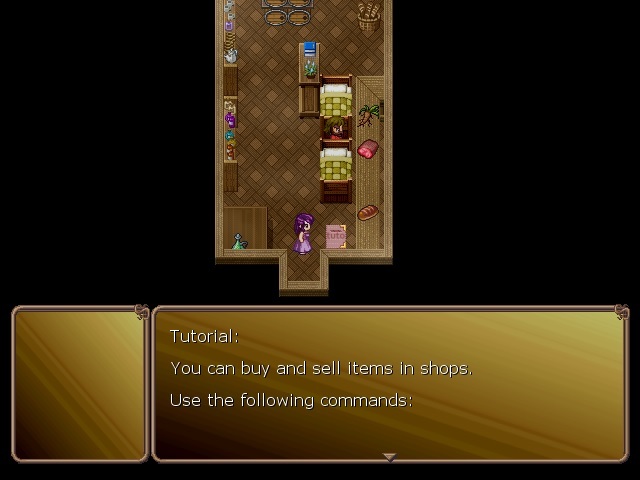 Along with combat is a typical quest system. Main quests begin and end automatically as you progress and sub quests are mostly picked up from talking to NPCs. These sub quests range from collecting noncombatants, such as frogs, snakes, and butterflies, while most others require combat to collect specific drops. Other quests require the use of the search system, which I’ll explain below. Quests yield rewards from items to experience and depending on the number completed, characters will start earning additional perks, such as increases to stats like HP or SP. While none of the quests are required, they can be worth the effort, especially on hard mode or just to catch newer party members up, as they join at lower levels than where your party will most likely be at their join time. 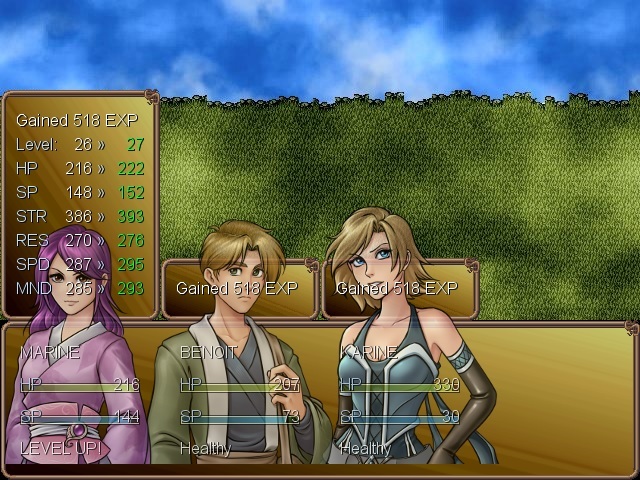 Outside of combat, Millennium features a search mechanic reminiscent of 2D point-and-click games. Using the mouse, you can run your pointer over anything and everything, potentially unveiling hidden items, secret rooms, or jump points. Almost all of the secrets uncover paths to unique treasures or give special orbs that can raise your stats when traded in at corresponding guilds. The mouse icon changes depending on the type of secret, for example it changes to a magnifying glass to note a hidden item or path and a pair of winged shoes to indicate a secret jump point. Although I can appreciate the attempt of adding this mechanic to a traditional RPG and even praise the base idea, secrets are everywhere and in overabundance to the point of overkill. The supersaturation of secrets combined with the utter enormity of the game’s maps combine to make a very stress inducing result. To put it bluntly, things can get ridiculous. This experience has the tendency to switch between intriguing and even satisfying at its best to complete and total nightmare at its worst. And again, I really do appreciate this discovery element, with its many natural search and exploration opportunities, however, it’s too often unenjoyable. Finding hidden items and secrets in Millennium is not an intuitive process, rather it comes off as obnoxious. As I mentioned, the play areas are massive, but having to stop the action to sweep every corner of the screen, move a few steps, and repeat the process will put a severe halt to any fun you were having. In spite of the innovative achievement of adding this point-and-click dimension of gameplay, it’s frequently more of a flow breaker than it is a gratifying puzzle element. Flow break is only aggravated by the controls, as using the keyboard is the preferred method of playing, yet the need for the mouse, still, is more a distraction than anything else. Now, I realize there are alternatives and third-party options to potentially alleviate some of this stress (ranging from assigning your own buttons, using a controller, gaming mouse, or other accessories), but I would have preferred more options to customize my controls right out-of-the-box. Instead of having to sweep my mouse every few steps to potentially uncover secrets, I wish there were a more developed system, perhaps utilizing hints, treasure maps, or markers to discover the hiding places of items or secret rooms. It shouldn’t require a screeching break to play and saint-like patience to get through all the searching. None of the secrets are required to beat the game, yet if you’re playing on normal or hard, those secrets that hide stat boosting orbs are immensely more important and missing out because of wanting to play at your own pace is undeniably regrettable. Refinement would certainly go a long way to making this mechanic truly enjoyable. 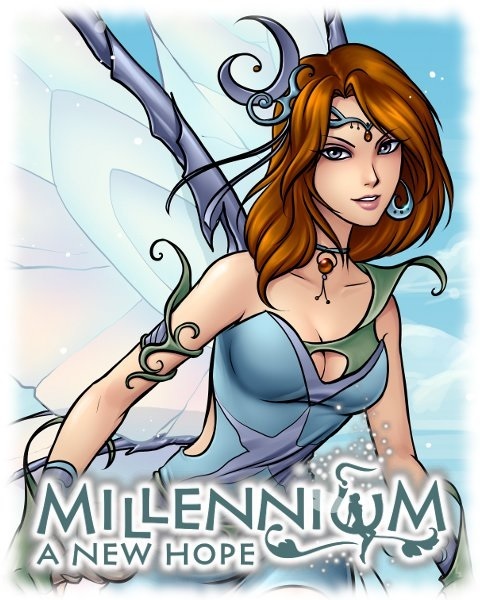 As if to exacerbate the search problem, Aldorlea Games has produced a guide for Millennium. I am not opposed to game guides in general, however, I hate how this particular guide is marketed. A deluxe version of Millennium comes with a 111 page guide (and other artwork). Or, you can buy the guide separate for $4 (which I find absurd, as the game itself is just a $2 difference on Steam [$6]). It gives me the impression that the ridiculousness of the item hiding was intentional to promote guide and deluxe version sales of their game. As if it weren’t bad enough how deceptive it is to hide secrets so delusory, to require further purchases on top of it all, no thanks, I’d rather just miss out a bit. Oh, and did I mention that not all of the secrets can be found with the mouse, as several of them don’t have the corresponding icon change, so you have to already know where the secret is located to collect? Forcing the need for a purchasable guide because of questionable development practices very much comes off as nickel and diming potential buyers of the game. The last I’ll say about this is thank goodness for GameFAQs and Steam community members with the patience and goodwill to offer free alternatives to an already debatable experience. Leaving gameplay behind, the most praiseworthy aspects of Millennium are its aesthetics. This game looks and sounds absolutely amazing. The character portraits are beautiful and help bring further life to our heroes. The enemy artwork is equally impressive, demonstrating inspired detail full of danger and ferocity. 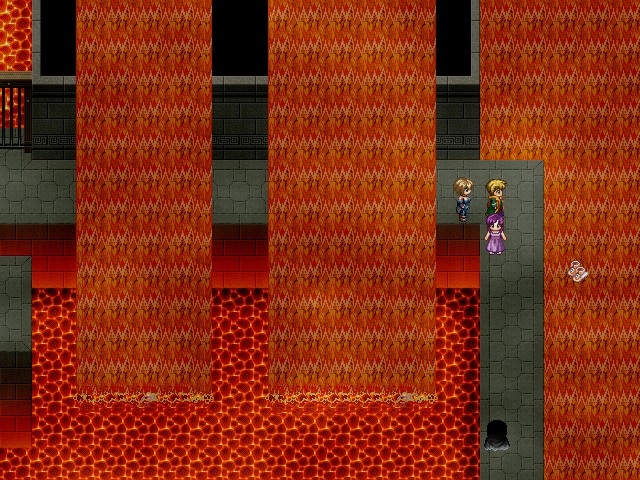 The sprites are charming and the tilesets are incredibly vivid. While some RPG Maker resources are used, it’s apparent just how much custom work was done to bring an original look and feel to the world of Myst and the results are unquestionably stunning. This is a beautiful game to behold, full of heart, and worthy of praise from any fan of the 16/32 bit art style. The sound score is equally fantastic, as every unique track pairs perfectly with its environment. These are hardly your prepackaged RPG Maker tunes. The rustic sounding village theme, with its slow tempo and calming nature fits perfectly with the farming/ agriculture tones depicted. The fast-paced and aggressive melody of the Ancient Temple, that combines a strong beat with a mystic sounding harmony, does a skillful job of conveying the forgotten, yet highly advanced nature of this area. Finally, the overworld theme for Myst is outstanding, as it fully expresses the grandeur and majesty of this fantasy realm. The only aesthetic complaint I have is with the limitations of the engine, as it forces skewing on widescreen monitors when in fullscreen. Regardless, this game, simply put, is aesthetically extraordinary and worth the playthrough to experience. Giving Millennium our flat average of 2.5/5 (or 5/10, 50/100) is actually quite arduous for me in the sense that, one, this game could have been truly sensational and, two, I was practically rooting for it to achieve a sustained high level of greatness throughout my play, especially due to the many sparks of sheer excellence the game manages to pull off. For a game that provides more than 20 hours of play the first time through, I am genuinely impressed by how many successes there are, from the characters and their interactions, to the aesthetic beauty full of passion and soul. Unfortunately, it’s incredibly difficult to overlook its shortcomings, from the loathsome searching elements, to the repetitive combat, the underdeveloped plot, and the blatant setup for a sequel; a focus that detracts from this game standing out on its own. Patience will be tried and tempers will flare, but this game has too much good going for it to simply dismiss. I would still recommend Millennium to RPG fans, albeit with a bit of mental preparation, because what it does right, it does so exceedingly that I’m genuinely wanting to continue on to Millennium 2.